Collaborations are without doubt a great idea when it comes to brewing – two different mindsets, two different approaches, many different flavours. The US Craft Brewing scene in particular embrace the sharing of ideas when it comes to one-off specials – Sierra Nevada and Dogfish Head with their ‘Life & Limb’ series, New Belgium and Elysian’s ‘Trip’ beers, not to mention many from Stone done in conjunction with others. Back in BeerCast #42 we featured Bashah, a black double IPA from Stone and Fraserburgh’s BrewDog – so it’s good to see the British brewers getting in on the action. Speaking of which, BrewDog have also joined up with Denmark’s Mikkeller, a very similar producer (both have the word uncompromising in prime position on their mission statements). 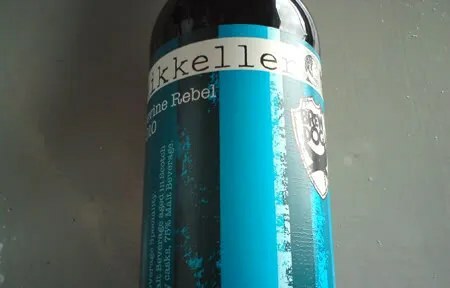 The result of this particular co-operation is Devine Rebel, an oak aged barley wine which was first released in 2009 following a Mikkeller visit to Aberdeenshire. That vintage weighed in at 12.1%abv, the 2010 version tops out at 13.8% in the 330ml bottle. Speyside whisky barrels provide the punchy flavours, with a further period of maturation in stainless steel tanks to give extra weight. It’s clearly highly carbonated, a furiously fizzing head disperses within seconds to leave a continual rising carbonation in the glass. The colour is wonderful – deep hazy raspberry, almost an opaque burgundy red. The smell is very tart, bitter, with some tobacco smoke mingling with the dark woody aromas from the Speyside casks. On the taste, peaty smokiness comes out, with a long, lingering finish that becomes almost rauchbier-like (although not as intense). It reminded me of their first foray into record-breaking, Tactical Nuclear Penguin (32%) – but with everything dialled back a couple of notches. It’s more drinkable than other oak-aged beers as there’s no caramel sweetness that can make other notable examples extremely cloying. It’s still a challenging beer however, the alcohol burn would make it overpowering after a while. As it warms, this becomes more and more apparent – at room temperature the strength really comes out. Oak-aged beers are difficult to balance, but Devine Rebel really benefits from the double helping of know-how imparted by BrewDog and Mikkeller.